Figuring out the shape of things — where to place what we see in the sky in a 3-D representation — has always been challenging. We’re looking out at a disk of stars from well within it, and it wasn’t until the 1920s and the work of Edwin Hubble that we began to see there were other such disks, not nebulae at all but galaxies in their own right, some bigger than ours. Interestingly, Immanuel Kant had speculated about this as far back as 1755. About our own galaxy, we still have much to learn, as I am once again reminded by a paper by authors from Macquarie University (Australia) and the Chinese Academy of Sciences. 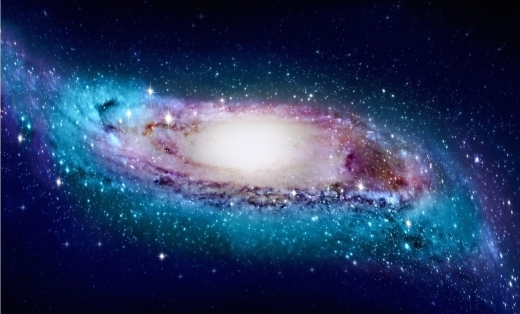 The Milky Way turns out to be not as flat as many depictions would have us believe. In fact, our galaxy shows distinct signs of warping, a spiral pattern that appears to be the result of torque produced by the Milky Way’s massive inner disk of closely packed stars. Image: A slightly exaggerated impression of the real shape of our warped and twisted Milky Way. Credit: Xiaodian Chen (National Astronomical Observatories, Chinese Academy of Sciences). The twisted spiral pattern is hardly unique to the Milky Way. 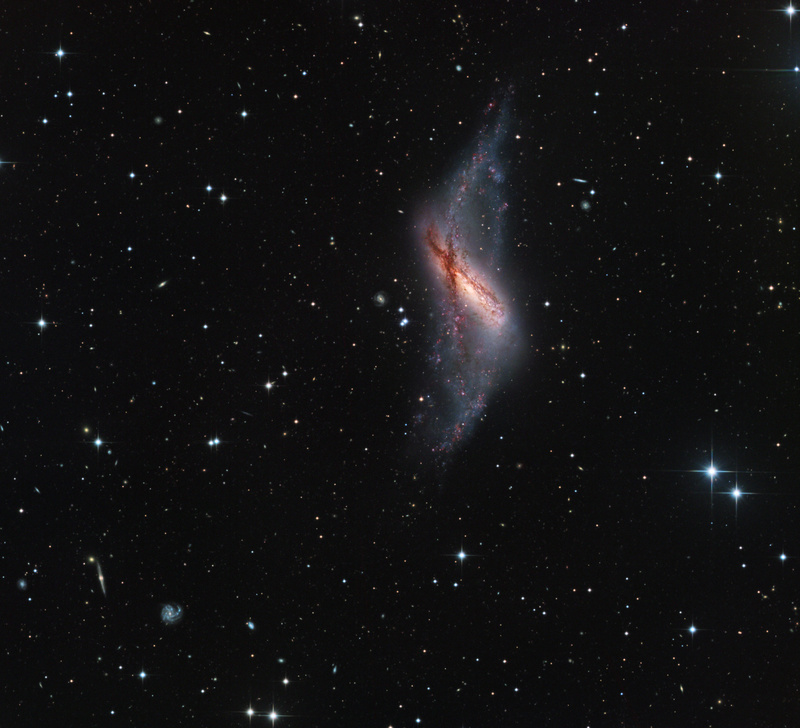 In fact, about a dozen other galaxies are known to display such patterns. 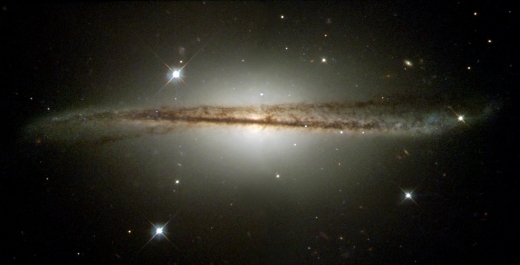 Image: The galaxy ESO 510-G13 is an edge-on warped spiral galaxy. Similar to the Milky Way it has a pronounced warp in its gaseous disc and a less pronounced warp in its disc of stars. Credit: NASA/Space Telescope Science Institute. Using Cepheid variables found in data from the Wide-field Infrared Survey Explorer (WISE) mission as well as a variety of optical surveys, the researchers set about producing a three-dimensional picture of the galaxy out to its farthest regions. Cepheid variables are helpful here because they vary in brightness, and their luminosity and pulsation period are directly linked. Observing a Cepheid variable’s pulsation period allows one to know its true luminosity. The distance to the star can then be calculated by comparing known luminosity to the brightness astronomers observe (hence the nickname ‘standard candles’ to describe such stars). …we establish a robust Galactic Disk model based on 1,339 classical Cepheids. We provide strong evidence that the warp’s line of nodes is not oriented in the Galactic Centre–Sun direction. Instead, it subtends a mean angle of 17.5° ± 1° (formal) ± 3° (systematic) and exhibits a leading spiral pattern. Our Galaxy thus follows Briggs’ rule for spiral galaxies, which suggests that the origin of the warp is associated with torques forced by the massive inner disk . The stellar disk traced by Cepheids follows the gas disk in terms of their amplitudes; the stellar disk extends to at least 20 kpc… This morphology provides a crucial, updated map for studies of the kinematics and archaeology of the Galactic Disk. Image: The units ‘kpc’ (kiloparsecs) along the image’s three axes are used by astronomers to indicate distances on galaxy-wide scales. One kiloparsec is equivalent to about 3,262 light years. Credit: Chen et al. 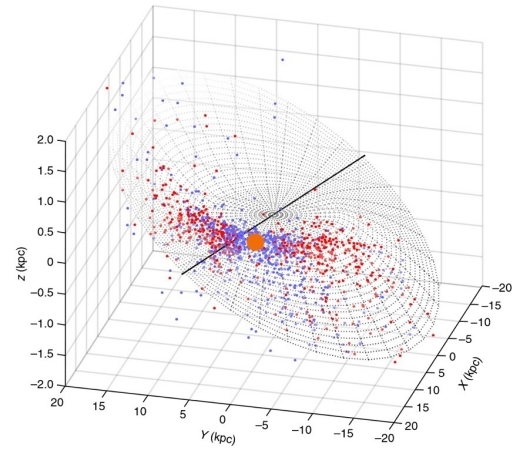 The paper is Chen et al., “An intuitive 3D map of the Galactic warp’s precession traced by classical Cepheids,” Nature Astronomy 04 February 2019 (abstract). Thanks to Alex Tolley for useful information on this work. There’s been a lot of interesting work in this area recently. An important assertion is that the apparent cut-off in the stellar disc is an illusion caused by the warp and flair of the outer disc. In fact the stellar disc extends to over 25kpc radius. Where is Andromeda (direction the Milky Way’s headed) on the kpc 3D graphic? I am interested in the Briggs paper that is referenced with regard to galactic warping dynamics but it’s from 1990 and arXiv doesn’t appear to go back that far. Anyone know if it’s available online and not behind a paywall? I had thought warping was due to mergers and interactions with other, smaller galaxies. Just in case anyone followed up on this, I found a copy. Thanks. Good. I was looking but had come up short. Paul, thanks for looking. In case anyone is interested here is the link I found for the 1990 Briggs paper. Although I have time to spend on this due to being housebound with the common cold my attention span is only a few minutes at a time, so I’m only partway through. I’ve been through the Briggs paper and I don’t see in there a study of or the conclusion “which suggests that the origin of the warp is associated with torques forced by the massive inner disk .” A couple of possible mechanism were suggested, referencing earlier work which I haven’t read. However, Briggs only included in his survey galaxies that are well isolated and have no companions, implying that it is something within the galaxy causing the warp. This doesn’t exclude warping due to external causes. For example, the Milky Way’s warp could at least in part be due to companions such as the LMC and SMC. At least I didn’t see this specifically ruled out in Chen’s paper. You wrote: Observing a Cepheid variable’s pulsation period allows one to know its true luminosity. The distance to the star can then be calculated by comparing known luminosity to the brightness astronomers observe (hence the nickname ‘standard candles’ to describe such stars). How reliable were the researchers’ measurements of the extinction due to dust and gas in the galactic plane? How would errors in that affect the observed degree of warp? The complete analysis of extinction appears in the ‘methods’ section of the paper. I wonder if this warp is more common to spiral galaxies than we think? I cannot help but wonder if the 2 different distributions noted are truly from different causes or from the same one.